So Q is no longer a Curly Q. His curls have almost completely grown out, leaving his long hair looking pretty ratty. I finally broke down and cut it off. He was excited for the haircut until chunks of hair started landing on his arms, and legs and face and then he didn't like it anymore. He started crying..."It'th tho thcratchy!" He hasn't really had his hair cut with the clippers, etc. so I guess he was just not used to it. At one point he broke down and sobbed and said "I just want to lay down...in your arms." Talk about breaking my little old mommy heart! But we made it through with a promise of a bath after. We are all still trying to get used to his new look, but he is not quite a baby anymore so I guess it's time. 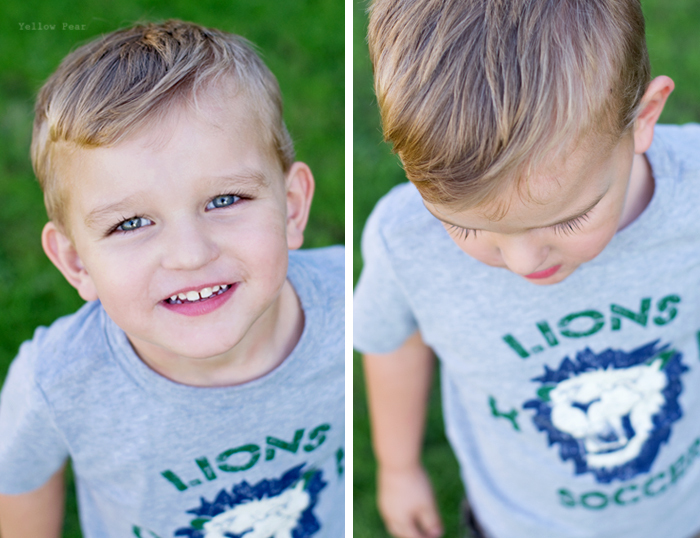 It's just kind of sad when your youngest baby grows up...and a hair cut definitely makes him look older. On another Q-related note...I was a bit down the other day, as I was having difficulty swallowing my food. They progressed me onto soft foods, but I guess my body wasn't ready and things were getting stuck (not a pleasant feeling). So I get to be on the liquid diet for another week to let things settle down a little more. Anyway, I was crying because I was frustrated and hungry and depressed a bit. Q saw me, walked over and said, "Whath wong Mommy?!" I told him my tummy hurt and he responded with a heartfelt sigh. Then he ran off and returned with his blanket and sock monkey and a very hopeful smile on his face as he handed over some of his favorite comfort items. Gosh. How could I not feel better? The sweetness, innocence and simplicity of a child cannot be rivaled. How sweet of him! I remember when we cut Tates "long" hair. Sigh. Ugh he looks so much older. Our babies are growing up. What a sweetie though.